Figure A. FITC conjugated Mouse anti Canine CD45 (MCA1042F) and purified Mouse IgG1 isotype control (MCA928) detected with Goat anti Mouse IgG1 DyLight 649 (STAR74D649). 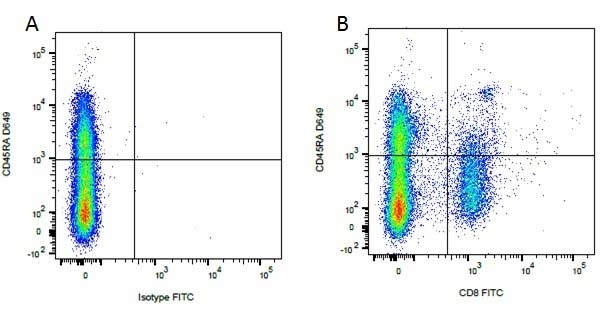 Figure B. FITC conjugated Mouse anti Canine CD45 (MCA1042F) and purified Mouse anti Canine CD11b (MCA1777S) detected with Goat anti Mouse IgG1 DyLight 649 (STAR74D649). All experiments performed on red cell lysed canine blood gated on mononuclear cells. 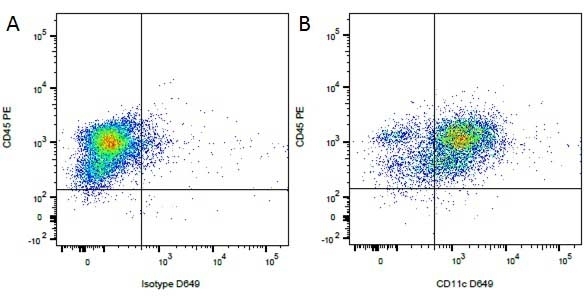 Figure A. PE conjugated Mouse anti Canine CD45 (MCA1042PE) and purified Mouse IgG1 isotype control (MCA928) detected with Goat anti Mouse IgG1 DyLight 649 (STAR74D649). 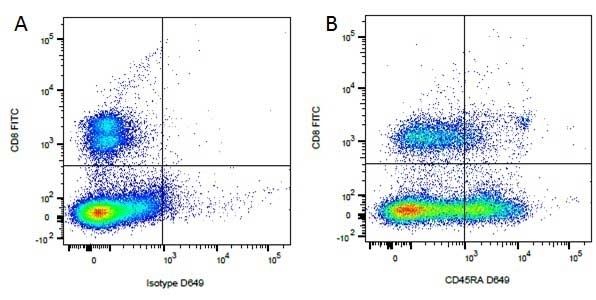 Figure B. FITC conjugated Mouse anti Canine CD45 (MCA1042F) and purified Mouse anti Canine CD11c (MCA1778S) detected with Goat anti Mouse IgG1 DyLight 649 (STAR74D649). All experiments performed on red cell lysed canine blood gated on monocytes. Figure A. A488 conjugated Mouse anti Canine CD4 (MCA1038A488) and purified Mouse IgG1 isotype control (MCA928) detected with Goat anti Mouse IgG1 DyLight 649 (STAR74D649). 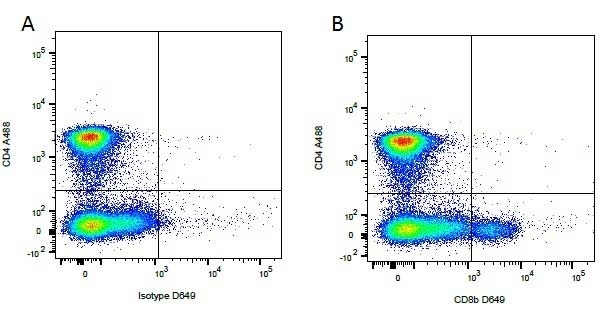 Figure B. A488 conjugated Mouse anti Canine CD4 (MCA1038A488) and purified Mouse anti Canine CD8b (MCA1775S) detected with Goat anti Mouse IgG1 DyLight 649 (STAR74D649). All experiments performed on red cell lysed canine blood gated on mononuclear cells. Figure A. Purified Mouse anti Canine CD8b (MCA1775S) detected with Goat anti Mouse IgG1 DyLight 649 (STAR74D649) and Rat IgG2b FITC isotype control (MCA6006F). Figure B. Purified Mouse anti Canine CD8b (MCA1775S) detected with Goat anti Mouse IgG1 DyLight 649 (STAR74D649) and Rat anti Canine CD4 FITC (MCA1038F). All experiments performed on red cell lysed canine blood gated on mononuclear cells. 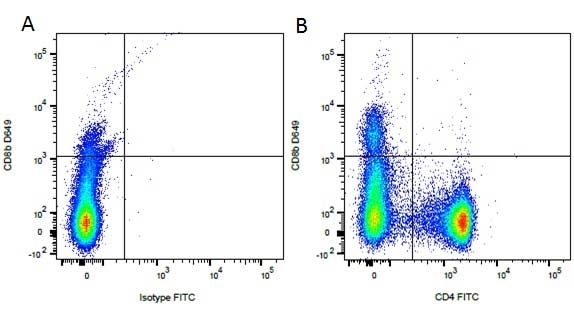 Figure A. FITC conjugated Mouse anti Canine CD8 (MCA1039F) and purified Mouse IgG1 isotype control (MCA928) detected with Goat anti Mouse IgG1 DyLight 649 (STAR74D649). 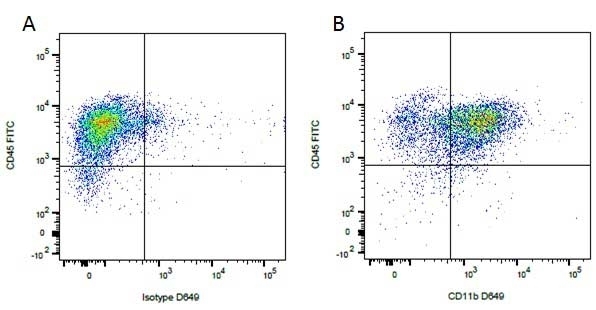 Figure B. FITC conjugated Mouse anti Canine CD8 (MCA1039F) and purified Mouse anti Canine CD45RA (MCA2036S) detected with Goat anti Mouse IgG1 DyLight 649 (STAR74D649). All experiments performed on red cell lysed canine blood gated on mononuclear cells. Figure A. Purified Mouse anti Canine CD45RA (MCA2036S) detected with Goat anti Mouse IgG1 DyLight 649 (STAR74D649) and Rat IgG1 FITC isotype control (MCA6004F). Figure B. Purified Mouse anti Canine CD45RA (MCA2036S) detected with Goat anti Mouse IgG1 PE (STAR74D649) and Rat anti Canine CD8 FITC (MCA1039F). All experiments performed on red cell lysed canine blood gated on mononuclear cells. Goat anti Mouse IgG (Rat Adsorbed) antibody recognizes mouse IgG. Cross-reactivity with rat IgG has been minimised by adsorption. Jarrett, B.R. et al. (2010) In vivo mapping of vascular inflammation using multimodal imaging. PLoS One. 5(10). pii: e13254.